VAC-A-TEE® is a trenchless cleanout system by LMK Technologies. The patented PVC VAC-A-TEE® saddle is prepared and attached to an appropriate length riser pipe which is equal to the depth of the lateral pipe. The installer applies a proprietary hybrid adhesive/sealant to the underside of the saddle. The saddle with a riser pipe is then introduced into the vacuum excavated hole and the saddle is snapped onto the lateral pipe by pressing downward on the riser pipe. The epoxy cures and forms a new watertight cleanout. A diamond core saw is then used to cut open the crown of the pipe. 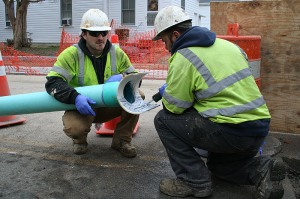 The VAC-A-TEE® system works with VCP, Orangeburg, Concrete, PVC, and Cast Iron pipes. Restoration to the small vacuum excavation site completes the VAC-A-TEE® installation.